Hercolaneum ,during the terrible eruption of the volcano vesuvius 79 AD, the city was completely covered by mud and lava flood, a city where we can review the charred wood construction, in perfect condition the ancient tabernae (food store ),the trade center (forum),the house of the Deer and the famouseThermal Spa and more . Was the aristocratic center,perfect to enjoy holiday by the see, meeting point of the rich Patricians. Well-preserved mosaics, one of the houses with perfect mosaic is (the House of Neptune and Anfhidrite) , the Thermal Spas of the Forum, the House of the Deer, the Forum and more. 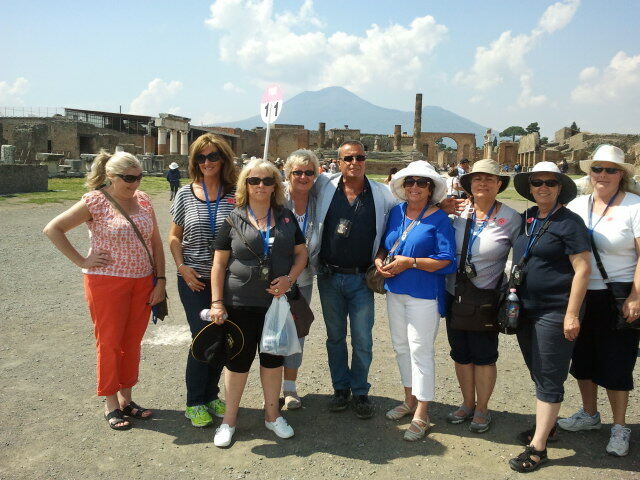 Expert archeological local guide will take you through the past, back to Hercolaneum life . An entire city, wich was quickly covered by mud and lava flood. Brought to light only after 1700 years.You will avoid lines of groups , we want you to enjoy with us a great tour of Hercolaneum ruins .A classical archaeological journey through the ancient city.